I have posted previously about how good this recipe is. I cannot get enough of this lemony goodness. In case you haven't tried it, I am giving you this reminder. This recipe will make a perfectly balanced salty, rich, filling, comforting soup. A Cook from Boston, MA, who said:"Try mine and you'll be hooked for life!" Boil broth, add orzo and simmer until tender 20 min. Whip whites until medium peaks, add yolks beating continuously, add juice, beating. Temper eggs with 2 c. broth, adding in constant slow stream while continuing to beat furiously so you do not curdle the eggs. Add egg mixture back to remaining broth and serve. When reheating, do not re-boil - heat slowly until very warm or you may curdle the eggs. Garnish with thinly sliced lemon. 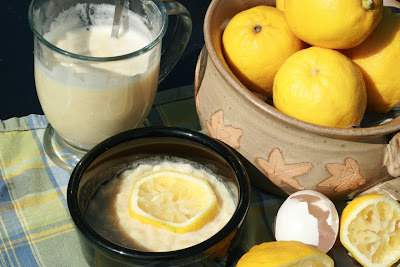 I sometimes add more than juice of 3 lemons, as the sourness is the best part of the taste! You should taste lemon, richness of eggs, salt of chicken, and starch of rice, in that order and you've made it perfectly. You can also add thin pieces of shredded chicken meat (pull off bone in strips), although classic recipes don't include chicken, vegetables, garlic or any of the ingredients many reviewers added to "fix" this recipe. So, so simple is the list of ingredients for such a pleasurable soup. Speaking of pleasurable, I have a wonderful surprise for you. Kelly and David have agreed to be guest bloggers for a week or two and just wait until you see what they will be bringing to your table. I am getting excited myself just thinking about it. So please let them know what you think. I'll be back soon! Hmmmm...sounds interesting. I've never would have thought to add lemon to my soup. This sounds simply delicious! I have to try this. The photo looks good, I bet it taste even better. If you wont mind I'd love to guide Foodista readers to your post. Just add the foodista widget to the end of this post so it will appear in the Foodista pages and it's all set, Thanks!